For the last 25+ years sulfites in wine have been vilified as the baddies that cause physical distress in the form of headaches and sinus pain. In reality, it is most likely other factors that cause those problems. The obvious one would be drinking too much! But there are many other possibilities. Why 25+ years? That was when Senator Strom Thurmond, teetotaler that he was, succeeded in getting the warning label about sulfites on wine bottles. 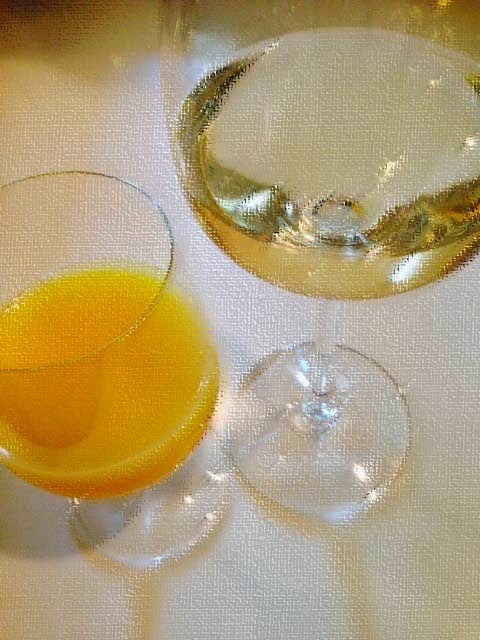 Even though there are more sulfites in a glass of orange juice, wine was singled out. And here's the crazy part, less than 1% of the population is really allergic to sulfites! Be sure to read this excellent article by wine writer Lettie Teague, columnist for the Wall Street Journal, "Wine Headache? Chances Are It's Not the Sulfites." It's truly eye-opening! Her reviews of wines claiming to have no sulfites are quite damning as she declares them undrinkable. Possibly the most important take-away from this article is a simple one; good quality, clean, well-made wines are the key to avoiding headaches and other alcohol-related ailments. It's that simple. And moderation of course. The obvious answer to this question might be "It's Fun!" But what drives some to near madness and obsession as depicted in the documentary Somm? A fascinating film (available for streaming on Netflix) that's even the wine-uninitiated will enjoy, that is, if "enjoy" is accurate. A group of young men striving for the exalted Master Sommelier qualification from the Court of Master Sommeliers. A sort of PhD for oenophiles, as is the Master of Wine post-nominal from the Wine and Spirits Education Trust. based in the UK. You will feel the anxiety and heartache right along with them. It's nuts! But in fact wine is fun! It's a living thing. It's romance in a glass. It's one of the few beverages that changes its personality from year to year, hour to hour. A recent visit with Languedoc winemaker Christophe Beau of Domaine Beauthorey enlightened his audience in this way: "There are three beverages only for me. Three important beverages. There is water. There is the best dead beverage in the world, Coca Cola. And there is the best living beverage in the world, wine." 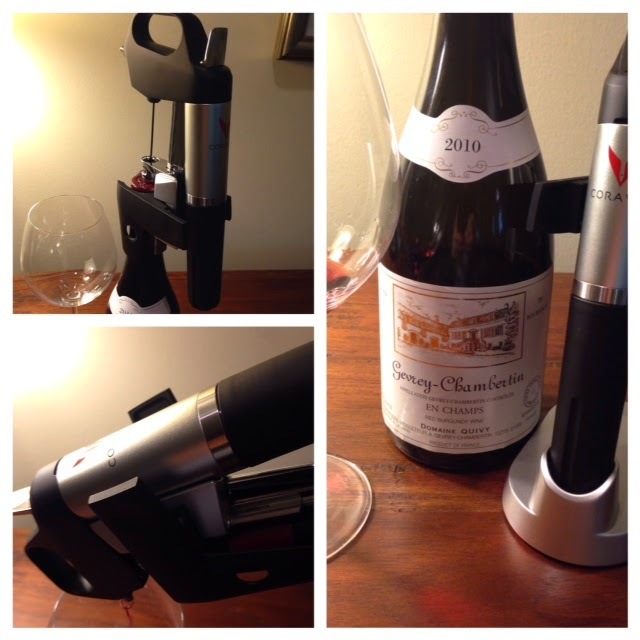 If you think you want to learn about wine, fear not. There are many levels of study. They aren't all life-consuming. Start with a website such as Local Wine Events and see what's happening in your area. One more reason to study wine - Camaraderie. Through this type of study lifelong friendships grow. In wine there is always more to learn. You and your study buddies will never, never run out of things to talk about. This is the story of the Restaurant That Could. A couple of years ago some fellows decided they would open a restaurant in the City of Chamblee. They chose a neglected 19th Century building across from the railroad tracks and they created an idea. Against all odds, with government red tape and snafus from the start, with sweat equity that defies logic, they created Southbound. This culmination of dreams and late-night wine reveries is about to open for dinner tomorrow night. (6-18-2014) Anyone who follows the local dining buzz should stand at attention and attend. From the Down-South but oh-so-cool menu to the most esoteric wine list in Metropolitan Atlanta and beyond, this is a place beyond the Pale. At a recent visit to the Abbaye de St. Hillaire in Limoux, France an excellent guide with a twinkle in his eye told the "true story" of the legendary monk, Dom Perignon. While many credit D.P. with the creation of fine bubbly, the St. Hillaire faction claim he stole the recipe and defrauded the monastery. They say he was expelled in disgrace! Très scandaleuse! What is the true story? We will probably never know. We do know that the monks of Saint Hillaire "discovered" the sparkling wine process a hundred years before Monsieur Perignon was amongst them. It is suggested that after storing their wine over a chilly winter, the bottles awakened in the spring with the dormant yeast shaking off hibernation and hungry for a sugary snack. Sealed bottles, busy yeast, all that expelled carbon dioxide built up and Voila! Fizzy wine that occasionally exploded the bottles. Over the decades they fine-tuned the process, learning how to expel the exhausted yeast, also called the lees, and eventually create the pristine, dry, delectable beverage we know today. Best of all, the sparkling wines from this region will not stretch your wallet. 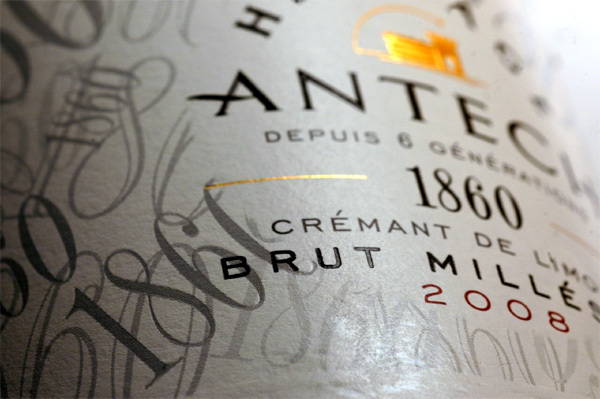 A note on a particular favorite from negoҫiant Maison Antech, the 2008 Heritage Cremant de Limoux Cuvée 186: A blend of 60% Chardonnay, 30% Chenin Blanc and 10% Pinot Noir, the toasty aromas leap out. There is a captivating scent of butterscotch but the wine is quite dry and mouth-watering. It spends 18 months resting on its lees which adds to the rich texture. This would pair beautifully with almost anything from the sea or a tangy chevre (goat cheese) on crisp baguette. If you could find this bubbly it would set you back a huge 12 Euros or so. They send most of their wines to Germany and the UK. Here's hoping we can entice more of them to the U.S.! Wine study at it's most relaxing may be found at Matthew Stubbs' school Vinécole,on the property of Domaine Gayda in Southern France. To be surrounded by beautiful vineyards, steady breezes and plenty of wine tasting and fine dining must be one of the most profoundly pampering experiences in life. Stubbs, a Master of Wine, instructs with a soothing low-key demeanor. His dry English humor occasionally interjects itself, gracefully avoiding the faux-gravitas that comes with so much wine education. If a trip to the south of France is not in your budget right now, be sure to take a peek at Matthew's website for upcoming seminars stateside. Continuing the theme of heat-worthy sipping, a 2010 esoteric pink by Clos Cibonne was highly recommended by a local fine wine shop. It's 90% Tibouren which has been aged over a year in large oak foudres under a thin layer of yeasty "florette." Come again? That's correct. And it costs more than many Provence rosés. Is it worth it? Absolutely. 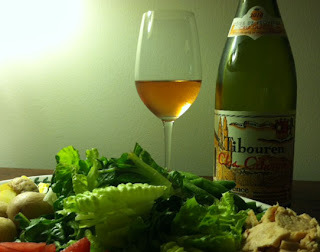 Not only is Tibouren an ancient, little-used grape, it's finicky with a relatively short life expectancy for the vines. It generally doesn't age well. So why bother? Because in the right hands, in the right location it's elegant, aromatic, and beautiful to look upon. Clos Cibonne is one of only 18 Cru Classé vineyards in the Côte de Provence region in Southern France. It sits near the Mediterranean coast in a protected "bowl." Brigitte and Claude Deforge took over the property in 2003 and have made it their goal to honor the tradition of this unique provenҫal grape. The hue is an arresting pale salmon with huge aromatics of orange zest, lavender and spice. The orange notes continue with the first sip, but take on more bitter orange and wild strawberry flavors. A background of clove and dried apricot lingers. While this is surely an excellent food pairing wine, such as with a classic Salade Niҫoise, it is captivating by itself... especially in the presence of palm trees.